Makings by Breakings! God's way up is down! For those of us who know and love Jesus, our whole experience in this life is like a great SCHOOLING. The LORD is our Teacher Who wants to teach each of us all we need to know about Him and His Love, salvation and service, and to help us to be yielded to Him and obedient to His Word. God knows that none of us will ever be able to really accomplish anything for Him and His Heavenly Kingdom in our OWN strength. In fact, Jesus said, "Without ME you can do NOTHING." (John 15:5) But the Bible says that we "CAN do ALL things through CHRIST!" (Philippians 4:13) If we will simply YIELD to the Lord and be truly WILLING to be whatever God may want us to be--not what we are, but what GOD wants us to be--THEN He can mightily use us! Of course, to become willing, yielded and submitted to the Lord is not something that we learn overnight. It takes time, it takes breakings, it takes suffering. And it takes lessons and experiences that make us desperate and cause us to draw closer to Him. The list is almost endless of all the men in the Bible whom God had to humble BEFORE He could use them, of all the leaders God had to bring down to the depths before they could stand to be exalted--lest they would have taken credit to themselves and not given God the glory! But was David's fall really a fall DOWNWARD, or a fall UPWARD? God's way up is sometimes down--USUALLY in fact!--Just the opposite of what we think! And David was humbled, and the whole kingdom was humbled, and they were all reminded that it was only the LORD Who made them great! And from that squeezing and twisting of David's life came forth the sweet honey of the PSALMS, and the fragrance of His praises to the Lord for His mercy! The great, brave and mighty prophet, ELIJAH, was able to call down fire from Heaven to confound the false prophets of Baal and to prove that he was right! (1Kings 18) But after slaying hundreds of false prophets, he panicked and ran away from one little woman, the wicked Queen Jezebel! 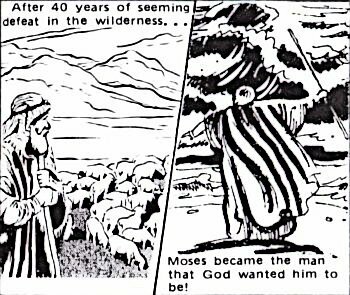 Hiding out in the wilderness, he became so discouraged that he wished that he might die! But there in his time of desperation, this prophet of fire and thunder became a meek little man who learned to listen to the still, small voice of God! And he became a much better, humbler instrument in the hands of the Lord.--A prophet who fearlessly returned to face not only the queen, but the king and all of their soldiers! As he was denying the Lord the THIRD time, Jesus, Who was being led by His captors to another part of the building, turned and gazed upon Peter, and Peter remembered how he had sworn that he would never deny Him. The Bible tells us that Peter then "went out and WEPT BITTERLY". (Luke 22:62) Was this the END of Peter's service for the Lord?--NO!--It was shortly after this humiliating defeat, this great failure, that the Lord used Peter to become the leader of the Early Church! So even if you don't always understand WHY you're going through tests, trials, hardships and breakings, remember, GOD knows what He's doing! He knows all the purposes and reasons behind each test, trial or trouble. He promises, "ALL things work together for GOOD to them that love the Lord!" (Romans 8:28) He is not going to allow ANYTHING to happen to you, His child, except what is for your GOOD! Of course, we often feel like, "My goodness! A LOT of things happen that don't look very good to ME!" But sooner or later you will find out that somehow or another they WERE good for you! You will find that God gets some of His GREATEST VICTORIES out of SEEMING DEFEATS.--Victories of yieldedness, brokenness, humility and utter dependence on HIM, which you MUST have if you're going to be what GOD wants you to be! So take heart from these examples from the Bible and don't be discouraged when things seem to go all wrong and your hopes are disappointed. GOD does not always see things as WE see them, "For HIS thoughts are not OUR thoughts, neither are HIS ways OUR ways" (Isaiah 55:8,9), and He does not judge or reward us according to our success or failures, but according to our FAITHFULNESS. In Heaven one day He'll say to those who are true to Him, "Well done, My good and FAITHFUL servant!" (Matthew 25:21) He won't say My "failure servant", or My "successful servant", but He'll say, My "FAITHFUL servant"! So above all, stay FAITHFUL to Jesus! And remember, your SEEMING DEFEATS can become great VICTORIES for the Lord if you will humble yourself and learn the lessons He is trying to teach you, like these men in the Bible did.